Three years ago this week (March 19th, to be exact), distilling resumed at the old Locke's Distillery in Kilbeggan. Founded in 1757, Locke's fell silent in 1953 but was resurrected in 2007 by Cooley using a small old still from Tullamore. Three years later, the spirit produced has matured to the point that it can legally be called whiskey. It's a bit of a hybrid, since it received its first distillation at Cooley's Louth distillery. 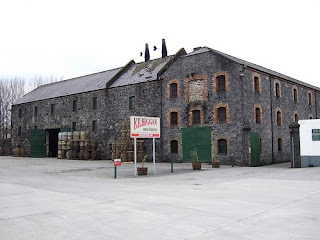 The resulting "low wines" were then transported to Kilbeggan for a second, final distillation. The spirit was filled into quarter casks which, just as their name suggests, are chopped down versions of the usual oak barrels. In these small casks, the spirit is exposed to a proportionally higher surface area of oak so it matures faster. Cooley will release some of this new whiskey in the coming months (just as they did for 1 month, 1 year and 2 year old Kilbeggan spirit). I've had the opportunity to sample a few of the casks over the last week. A couple of them are already very drinkable, whereas others are taking longer to mature and still have some of that ripe fruit aroma of fresh spirit. In mid-2009, Kilbeggan installed a brand new, larger still of a similar design to the first. First distillation still happens in Louth but it can now be distilled a second and third time in Kilbeggan. The experimentation won't stop there. Cooley is going to install new mash tuns and a fermentation vat in Kilbeggan. These are being made to order in Scotland (the mash tuns from Forsyth's and the fermentation vat from another company) and will hopefully appear on site this year. At that point, whiskey can be made entirely in Kilbeggan. It can still get a third distillation by running the spirit twice through the larger pot. Once the mash tuns are in place, the distillery plans, according to manager Brian Quinn, to try out the old Locke's mashbill of 60% malted barley, 35% unmalted barley and 5% oats. This is good news. Not only will it be the first genuine "pure pot still" from Cooley it will also be the first time oats have been included in an Irish whiskey recipe for decades. This is an important contribution to the revival of the craft of Irish whiskey manufacture. And that's not all! But I'll leave the rest for another post.